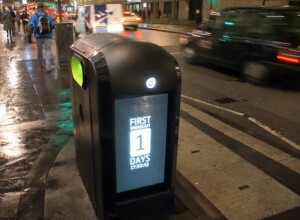 DailyDOOH » Blog Archive » Rubbish Network Software. It’s Official! Rubbish Network Software. It’s Official! It may have taken the Renew people, owners of the City of London Rubbish Network, well over five years to get their bomb proof (where are the IRA when you really need them?) litter bins onto the streets of London but that long, long gestation period didn’t help them choose wisely when it came to digital signage software and a CMS. Anyone care to guess what software they chose out of all the 100’s of vendors in the marketplace? Well, in a decision that makes the Mood Media signature Digital Signage player installation across the Clear Channel France screen network look sensible let’s give you a clue shall we? Think of a small, tiny little UK player. Think of Cambridge, England and then think of a UK vendor that went into administration and out of business a few weeks ago. Yep! that’s right – Camvine. If you take a look at http://renewchannel.com/ you can see the copyright notice for the site software at the bottom of the screen. RenewChannel · Log in … You can’t just use a CODA login here; you do need an explicit RenewChannel login. © 2012 Cambridge Visual Networks. RenewChannel · Log in. Welcome to RenewChannel. Please login to use the system. © 2012 Cambridge Visual Networks. If that is’nt ROFL then we dont know what is. This entry was posted on Friday, February 17th, 2012 at 08:49 @409 and is filed under DailyDOOH Update. You can follow any responses to this entry through the RSS 2.0 feed. You can leave a response, or trackback from your own site. Stephen Cork and Joanne Milner of Cork Gully LLP, 52 Brook Street, London, W1K 5DS were appointed joint administrators of Cambridge Visual Networks Limited – t/a Camvine on 31 January 2012 (High Court number 784 of 2012).